The globalization of the IC supply chain has induced vulnerabilities at various stages of IC production. Here, the red zones stages are untrusted and can be exploited by an attacker. Credit: Rangarajan et al. In recent years, hardware-centric security threats have emerged at different stages of the integrated circuit (IC) supply chain. This has enabled the proliferation of various malicious attacks, such as intellectual property (IP) piracy, illegal overproduction of ICs, and insertion of hardware Trojans. Out of all existing defenses against IP piracy, only logic locking has so far been found to offer effective end-to-end protection. To address these challenges, a research team at the New York University Center for Cybersecurity and Quantum Nanoelectronics Lab has developed a dynamic camouflaging approach to thwart IP reverse engineering at all stages of the supply chain. "The globalization of the integrated circuit supply chain has resulted in the outsourcing of various steps of the microelectronic chip production," Nikhil Rangarajan, one of the researchers who carried out the study, told TechXplore. "Chips are typically designed and/or procured from one country, fabricated in another, and finally tested and packaged elsewhere. This worldwide chain opens up lot of opportunities for attackers to steal the underlying IP, indulge in overproduction, or even insert malicious modifications known as hardware Trojans." According to estimates, the semiconductor industry loses billions of dollars every year due to IP theft. To mitigate this damage, the research carried out by Rangarajan and his colleagues specifically focuses on preventing IP theft. Dynamic switching of polymorphic circuits on-the-fly. Credit: Rangarajan et al. "The inspiration for our idea came from nature, where some animals like octopus are able to change their physical appearance to adapt to their environment to avoid detection by prey or predators," Rangarajan explained. "We thought: Why can't the electronic circuits we seek to protect also change dynamically to avoid detection by an attacker?" Existing defense mechanisms for the prevention of IP theft, such as static camouflaging, require the designer to trust the foundry commissioned for the chip's fabrication. On the contrary, the threat model devised by Rangarajan and his colleagues assumes that an attacker might also reside within the foundry or in the test facility, or could potentially be an end user. "By using innate properties like polymorphism, multi-functionality, and post-fabrication reconfigurability offered by emerging spintronic devices, such as the magnetoelectric spin orbit (MESO) device, we were able to achieve dynamic camouflaging," Satwik Patnaik, another researcher involved in the study, told TechXplore. "Polymorphism is intended in the particular means through which the device can readily implement different Boolean functions at runtime, where the functionality is determined by an internal or external control mechanism." In the scheme devised by the researchers, a potentially malicious foundry fabricates the logic gates as "black boxes," which can only be configured by the designer once the fabrication process is complete. This prevents an attacker within the foundry from deciphering the intended functionality of the chip that is under fabrication, as it is yet to be configured. Dynamic camouflaging is possible with the help of novel spintronic gates like MESO gates. These gates can implement several Boolean functionalities in one device and can also switch between them during runtime. Credit: Rangarajan et al. "This 'post-fabrication re-configurability' property also enables protection from untrusted test facilities, as the chip can be configured for any dummy functionality unknown to an attacker and restored to the true functionality once the testing has been carried out," Patnaik explained. "In short, while prior works in IC camouflaging are static and have to trust the foundry, our scheme doesn't require the designer to trust the foundry or the test facility." The researchers evaluated the effectiveness of their approach in counteracting state-of-the-art test-data mining attacks, such as HackTest, and side-channel analysis, where adversaries aim to decipher the IP's functionality. They also explored its performance with powerful Boolean satisfiability attacks, including SAT and approximate SAT (AppSAT), which are typically preferred by end-users. Their dynamic camouflaging approach yielded promising results in all these tests. In the future, the researchers believe that it could help to thwart attackers within untrusted foundries or test facilities. "Our scheme leverages the unique properties of spin-based devices," Rangarajan explained. "These properties, especially polymorphism, cannot be afforded by current-day CMOS technologies, due to the fundamental limitations of CMOS devices. We also want to emphasize that the general notion of dynamic camouflaging could be implemented with other emerging devices, as long as they have similar properties." A Boolean satisfiability attack mounted on a dynamically camouflaged circuit can easily yield an incorrect key and mislead the attacker. Credit: Rangarajan et al. To promote the implementation of their defense technique, the researchers also envision a hybrid CMOS-spin based integration. This integration could facilitate the adoption and acceptance of their scheme, as well as of devices that support it. According to the researchers, several academic studies are currently heading in similar directions. 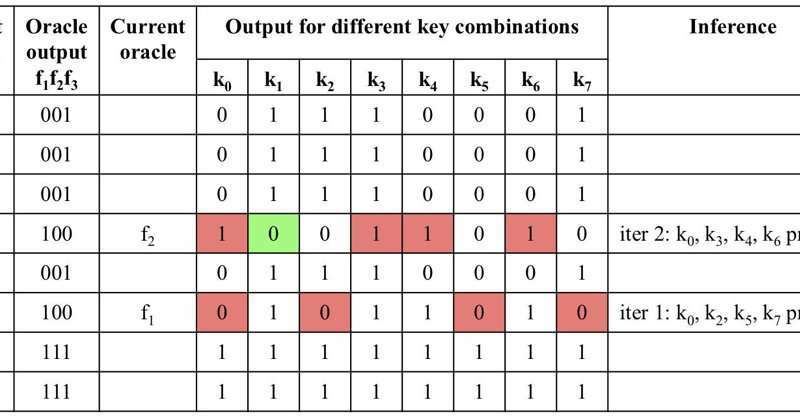 Rangarajan and his colleagues are now planning to investigate the implications of using run-time polymorphism to protect approximate logic circuits, which have been gaining a lot of traction over the past few years. These types of circuits trade off output accuracy for a steep reduction in power dissipation. "Especially with the advent of the Internet-of-Things (IoT), we believe that the protection of approximate computing chips is also essential, given the fact that they are widely favored to be used in systems that require low power operation," Rangarajan said. "We also plan to evaluate the resilience of our scheme under other attack scenarios, to gain further confidence in our approach." Whose intellectual property? The biggest IP theft is that done by industry itself which hides the ideas of our publicly educated scientist forced to work as serfs in corporate monopolies. I find this research disgusting and should be branded as illegal and illegitimate. We need laws that prevent technology obfuscation. Most so called IP belongs in the public domain where it will do the most could and stimulate the most innovation. Its ridculous these guys get to rake in billions by not patenting, obfuscating technology, and corrupting trade secret laws. Companies and corporations should do what they do best...making and marketing a product...not owning knowledge and keeping it in chains . Tech companies have benefited handsomely by standing on the shoulder of a far more generous and sharing intellectual culture that preceded them. The buck doesn't stop with them...and if we are stupid enough to let it, we will creat technological feudualism and stagnation for centuries. So if one does not owe an allegiance to an Almighty higher power then self-control and an adherence to the principles of truth and honesty which excludes theft is just so much hot air. So planting malware and spyware is just a consistent outflow of an evolutionary worldview - there really is not right or wrong or good or evil, there is only what is: Material. Hence these people who break in and steal are simply living according to their evolutionary origins and ethos. Kill or be killed, steal or get stolen from, subdue or be subdued, take or get taken from, lie or be lied to and so on. Nothing extraordinary, really. The great debate about IP, is ultimately an essential debate about mankind and sharing. I would argue that we are so down the rabbit hole of over-propertization, that it is ESSENTIAL to pick and choose your battles when focussing on what should be de-propertized if you want to be taken seriously as a freedom frighter for free thought and free ideas. in the current milieu of propertizing tax subdized research through copy-right , and the explosion of abusive business-method patents, that conventional patents for hardware , such as this one are perfectly defensible and have a place . a world of free technology may not happen overnight and may not even be desireable overnight. freedom occurs through evolution not revolution. casting off one fuedal lord swapped for the other. china's freewheeling copying ways aren't evil, but they don't make the Chinese economy a bastion of freedom, only a state blessed jungle. human jungles have their use, and some freedom but don't idealize them.